One night, storm of aliens from unknown planet invade Earth!. You job is simple: Stop them before they reach our ground! 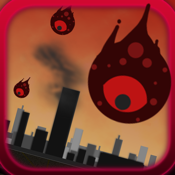 Alien Defender is action-strategy game where you have to prevent aliens from reaching the Earth. For that, you have 3 defense systems: Bomb, Nuclear Bomb, and Laser Barrier. Aim and fire bombs at the aliens. You can even control bomb trajectory mid-air. Speed of bomb relies on how fast you fire them. Alternatively, you can use bombs to charge your nuclear weapon. Nuclear weapon is very powerful, fire it once and it kills all aliens currently attacking. Laser barrier kills any alien hitting it and degrading its life at the same time. Laser barrier will keep raising against aliens. You can lower it by hitting lever switch. Be careful, once your barrier is gone, you can't have it back. Aliens have their specialty, too. Some alien carries radioactive elements with them and destroying them help charging the nuclear weapon. Some helps alert the Earth soldiers to dispatch the bomb faster. There are some gameplay-related easter eggs. Play with trials and errors to find out! Remember: You only have time till dawn!